SBI offers one of lowest gold loan rate of 10.55% , both for its existing bank customers as well as new borrowers. SBI jewel loan interest rate varies by amount of loan, purity of gold and loan to value ratio. Check Best Offers. SBI offers loans against gold with simple documentation, quick processing, and no hidden charges. You can avail gold loans of long tenure of 30 months. SBI has a special agricultural gold loan scheme for borrowers engaged in farming and looking to borrow funds for meeting their farming expenses. SBI interest rate on agricultural gold loans is lower than that of its regular gold loan scheme. How can I get a Gold Loan from SBI ? You can apply for a gold loan with SBI directly through branch walk-in or by filling an online application form. However, to get the best gold loan rate offers and comparison of all banks, you can apply online through MyLoanCare. 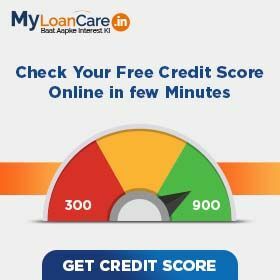 MyLoanCare will give you a detailed comparison of gold loan schemes of all banks, calculate your gold loan eligibility and connect you to the best bank for gold loan. Customer representatives of bank will get in touch with you instantly to fix up an appointment for branch visit. You will also be assisted by a dedicated MyLoanCare loan executive who will ensure that the process of getting loan is smooth, convenient and quick. You can get gold loan in a single branch visit during which SBI will do an appraisal of your jewellery in terms of its purity and weight. In case, the jewelry meets the bank standards, the bank will sanction your loan and give you an instant loan against the security of your gold jewelry. Lowest Gold Loan Interest Rate in SBI is 10.55%.The factors that are used by SBI to calculate interest on gold loan are loan amount, loan tenure and loan required as a percent of value of gold jewelry. SBI’s existing account holders get gold loan at best rates compared to other customers. Loan Amount: The amount of gold loan you can avail depends on the weight of jewelry you can pledge with the bank. Generally, banks offer a jewel loan per gram of gold which differs by the purity of gold and loan to value ratio offered. Banks offer lower interest rates for higher amount. SBI offers loan between Rs. 20,000 and Rs. 20 Lakh amount. Relationship with the Bank: SBI offers special rates, offers and charges to the existing account holders of the bank. Those who have made their payments on time in the past can get the benefit of low gold loan interest rate from SBI. Loan tenure: Many banks charge higher rate of interest for gold loans of lower tenure and lower interest rate for gold loans of higher tenure. SBI offers gold loan with a tenure of 3 months to 36 months. Loan to Value ratio: Maximum gold loan to value of gold jewelery ratio on gold jewelry has been fixed at 75% by RBI. However, SBI also offers loans at lower LTVs. Interest rate on loans with lower LTV will be lower compared to loans with higher LTV. Maximum LTV offered by SBI is 75% calculated on net weight of gold in your jewelry. Purpose of Loan: All banks, including SBI also offer gold loan for agricultural purposes at low concessional rates, as the same is counted under priority sector lending targets of the bank. SBI's gold loan interest rate for agricultural loans is generally lower by 1-2% compared to its gold loan rate for regular customers. Processing fees – SBI charges minimum processing fees 0.50% of the loan amount subject to a minimum of Rs. 500 . 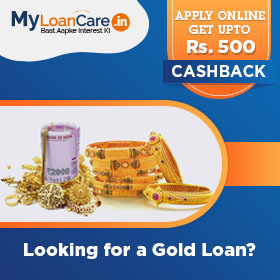 To get lowest fee, gold loan interest rates comparison, offers and cashback apply online through MyLoanCare. SBI offers a bullet repayment option for its gold loans. Under this, customers can pay the entire principal amount of the loan at the end of the tenure. SBI offers this scheme for farmers wherein, loan is offered to them against gold ornaments in order to meet farming expenses. Presenting a proof of farming activity and ownership of an agriculture land is mandatory. The end use of the gold loan must be mentioned by the borrower. The current rates for SBI Gold Loan for Agriculture are in the range of 7-9.95%. Is gold loan SBI available online? Is there a SBI gold loan online payment facility? Yes, you can apply gold loan online in SBI to get a quick loan. Yes, SBI offers gold loan online payment facility. Does SBI offer Agricultural Gold Loan? Yes, SBI offers gold loan for agriculture at 1- 2% lower interest rate than gold loan rates. How much gold loan can I avail from SBI? You can get upto Rs. 20 Lakh as gold loan from SBI. State Bank of India (SBI) has announced the launch of a new gold deposit scheme for gold lovers. Under this scheme, the customers can earn additional income on the gold kept in the house. A person making an investment in gold can earn interest at the rate of 0.55% to 2.5% per annum on the deposited gold. To start the investment, a customer can deposit at least 30 grams of gold however, the bank has told that there is no limit to deposit maximum gold. With borrowers delaying repayments on agri loans and delinquencies on the rise, State Bank of India (SBI) has decided to reduce the losses in the agri segment by making loans backed by gold. The agri loan portfolio of the bank shrunk by 0.3% to Rs. 1.9 lakh crore while all the other segments of domestic advances saw a positive growth. State Bank of India (SBI) has revised gold loan interest rates. The rates have been revised to 10.55% from 10.25% earlier. The processing fees are 0.50% of the loan amount subject to a minimum of Rs. 500 and tenure up to 36 months. One of the leading gold loans providers, State Bank of India (SBI) is expecting its loan growth to be around 12 percent in the second half of the financial year 2019. In addition to this, the bank also has plans to further improve their overall loan book including business loans, personal loans and home loans in the coming year.